The weather has turned cooler, so we decided to grill last night. Grilling had been on the menu for Wednesday, but it didn’t work out for that evening, so I had everything we needed on hand. DH was running late with work, so I decided to stick the pork steaks under the broiler to give them a head start. 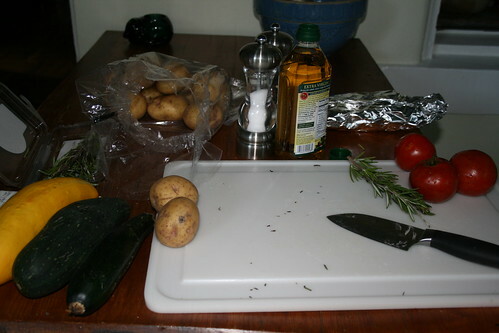 Then I moved on to preparing the veggie packets. 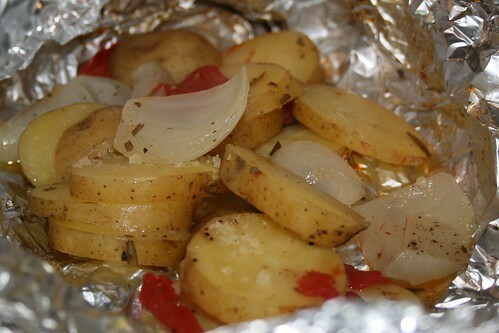 I found this recipe for grilled potatoes and it reminded me of the foil packets we made as I was growing up. My mother would put a hamburger patty and potatoes (and any other veggies we wanted) into a foil packet and we would cook them over a camp fire or at home in the oven. If I’d had carrots, I would have added them, too. And garlic would be good in these. Whatever floats your boat. 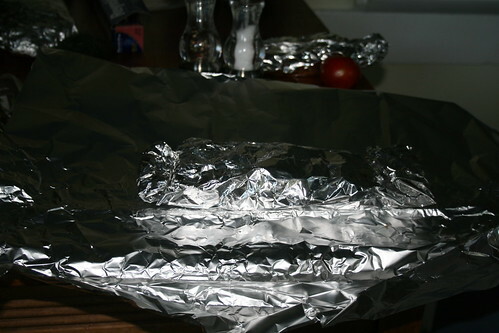 Put two layers of heavy duty aluminum foil on the table, one on top of the other. Prepare the veggies and lay them on the foil. Tomatoes add a great flavor to this dish, if you like tomatoes. We have plenty from the garden right now so I used them in my packet and DH’s. 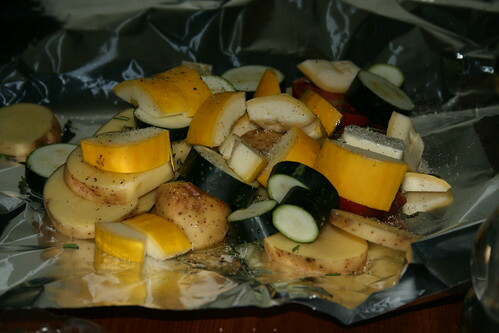 DH’s packet also had zucchini and yellow squash. Mine had the addition of yellow onion. After the veggies are done, sprinkle with chopped rosemary (delicious! ), a pat of butter, a drizzle of olive oil, and salt and pepper to taste. Spread the veggies a bit, then wrap in the foil, one layer at a time. I turned the dull side out on DH’s and the shiny side on mine so I would know which one was which. Throw on the grill for 25 – 30 minutes, or bake in the oven at 375* for 35 minutes. This is my packet. Doesn’t it look delicious?? And it was! 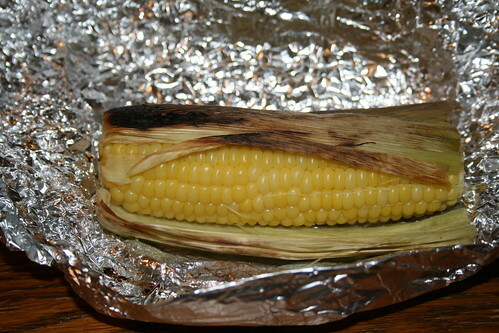 A friend brought over fresh sweet corn in the afternoon, so we grilled some of it, too. 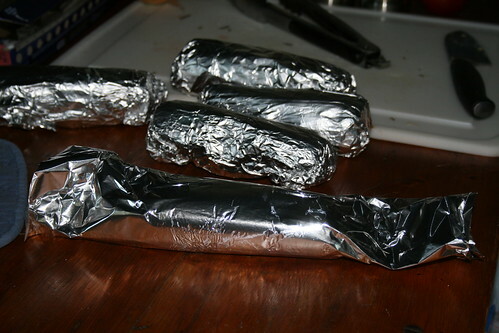 The ends were already trimmed, so I decided to roll them in foil to grill them. I pulled the husks back enough to remove the silks, replaced them, then wrapped the ears in foil. No need to fold the seam of the foil to seal it. Just roll them up, then fold the ends over. If you want to, you can add butter, olive oil, seasonings, salt, pepper, etc. to the corn before you close them, but I made them plain. 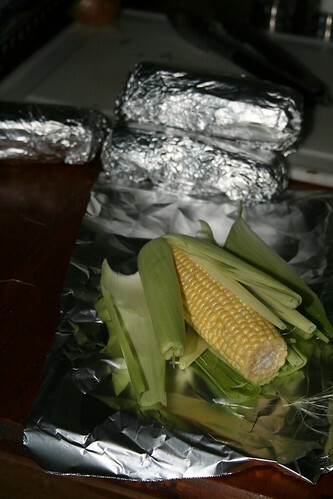 Some recipes ask you to soak the corn before grilling, but I didn’t because we were grilling them in foil, not just in the husks. The pork steaks cooked wonderfully under the broiler, then we finished them off with Sticky Fingers BBQ sauce on the grill. A delicious meal. 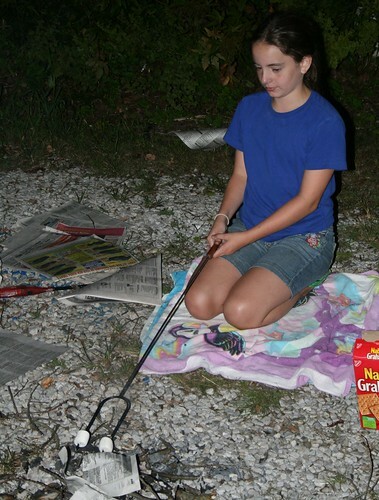 DH and I didn’t have room for any dessert, but DD built her own little fire in the driveway and made a S’More. This entry was written by ~~Rhonda, posted on August 22, 2009 at 1:57 pm, filed under cooking, Recipes. Bookmark the permalink. Follow any comments here with the RSS feed for this post. Post a comment or leave a trackback: Trackback URL.